Activist linguistics, as I see it, does not mean that the researcher skew her or his findings to support one group or one ideology or another. Nor does it mean that a famous linguist use her or his fame to support causes. Rather, an activist linguistics calls for researchers to remain connected to the communities in which they research, returning to those settings to apply the knowledge they have generated for the good of the community and to deepen the research through expansion or focus. In some ways, my PhD research area is a deeply personal thing. It might be about a social movement and people and events a hundred years ago, but it encompasses areas that I care deeply about: gender equality, the theory and practice of protest, marginalised and disenfranchised groups, the interaction between ideology and practical legislative change. 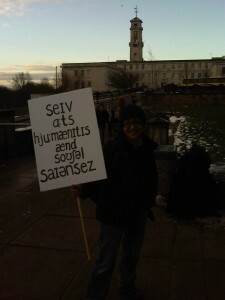 The photo is one of the more visible acts of protest I’ve done recently – it was taken on a cold winter’s morning before I went to London to protest about cuts to arts, humanities and social sciences. That experience led me to write this post. I worried quite a lot about whether my personal politics would affect my research for the worse. Would it make me too sympathetic, unable to see the flaws in direct action? Would I end up hopelessly over-identifying with the subjects of my research? 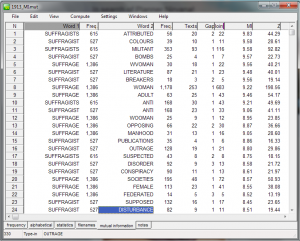 Would my thesis become a paean to the suffrage movement? Would I, too, end up setting fire to a boathouse? Worrying thoughts indeed. But now I’ve started wondering about neutrality. Is actual neutrality even possible? I’m not convinced it is; to me it seems that you can simply not know enough about an issue to have an opinion, or that your apparent neutrality is itself a stance. I’m reminded of debates within feminism where those allegedly objective about it are actually hostile – there are some things it’s hard not to have an opinion about, and if you’ve chosen to distance yourself from an issue you’ve still made a choice about how you’re going to engage with it. As I said in my post on direct action, being a protester has given me an insight into the kind of things the suffrage movement encountered. When I wrote that post it was police violence; as I write now, it’s the tensions between different groups and factions who are (roughly) campaigning for the same things. As O’Connor suggests, things like this are going to inform one’s research whatever I do and my issue is one of how to allow it to do so, how to acknowledge it and be honest about its influence. There are different ways to engage with one’s activism and individual politics, and it’s clear which she thinks is best. As well as making for better research, I think the researcher also owes something to the community in which they’re embedded. As an undergraduate I was staggered by Jennifer Coates’ admission that she covertly recorded her friends for material. At the time it was an acceptable methodology to make such recordings; now it is most definitely not. I’m not studying NSAFC (if I was I’d tell them!) but that earlier post was still an attempt to apply my research to my community, to give back something – kind of connecting my experience as a researcher with my experience as a protester, and trying to synthesise them in to sort of whole I think O’Connor is talking about. As a tangent, I stumbled upon Emily Davison Blues by Grace Petrie a couple of months ago. There’s a research paper in contemporary reimaginings of the suffrage movement, I know it. Okay, I was going to go to bed at least an hour ago. Tomorrow brings more narrative theory and newsworthiness, yay?